Happy Monday! While the one hour "loss" of time because of Daylight Savings was a bit of a bummer, I LOVED having sunshine through 6:30pm! It's going to feel so much more like spring and summer with the extra light. For me, this weekend was actually "perfect." We hung out with friends, lounged, enjoyed the good weather and my husband surprised me with a lovely date night on Saturday (since we went to a good-bye party for one of his friends on Friday). There was just enough ease throughout the weekend that I felt relaxed rather than overwhelming busy. So this oldie but goody of a sequin skirt dressed down well with my jean jacket and Chucks. Just a gorgeous skirt!! Love it combined with the denim and converse! $100 ASOS giveaway on my blog! You seriously are the queen of mixing casual and dressy...LOVE this outfit! I need to experiment more with that. love the contrast of this outfit, stunning!! I love this look! That sparkly skirt is so fun with the shoes and hat. You look fabulous! I just love how you mix girly and tomboyish pieces. I love that you wore this fancy skirt with a denim jacket and sneakers. You look so gorgeous! Glad to hear you had a great weekend! I'm sure the city was stunning. I love that skirt...it's so cute with the Converse and denim jacket! Wasn't the extra dose of sunshine a lovely benefit of the spring forward? I thought so, too! Love the skirt, Nancy! And glad you had a great weekend - I did too. Still getting used to the loss of the hour but I'm glad it'll be light out after work now. I wish this skirt was still in stores...I love it! Wowza - that skirt is too fabulous! I love how you dressed it down with the denim. Nicely done, girl! It does sound like a perfect weekend. I love the casual chucks and hoodie mixed with that shimmer skirt. And I love that it doesn't get dark until 7:30 now! 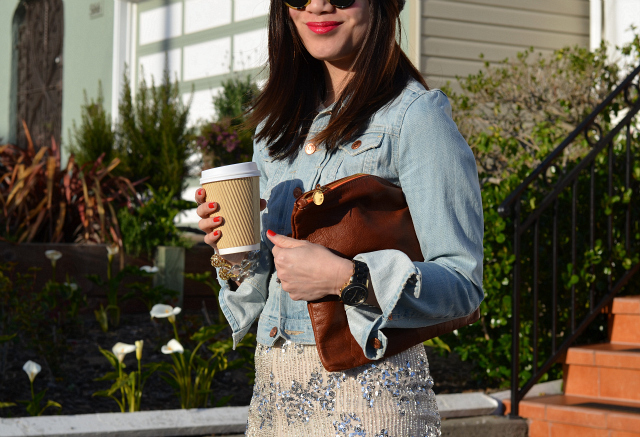 LOVING that sequin chevron skirt!! ive been looking for one for so long!! you look awesome, we love that skirt! very nice pictures!!! your outfits are perfect! I LOVE the sequins for daytime! Great combo! That really does sound like the perfect weekend. How sweet of your husband to surprise you with a date night! I love your skirt and the way you styled it :) I hope your week's off to a great start! I'm so in love with your skirt - and the way you've styled it!! 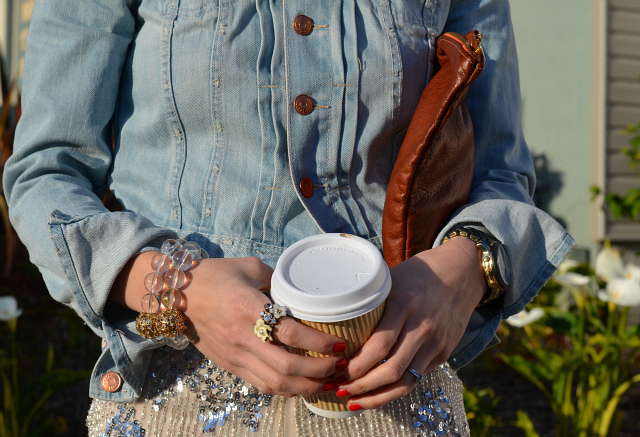 I love the sparkly sequins against the denim jacket! Tres chic! and thank you for stopping by my blog and leaving me a sweet comment. love that sequin skirt nancy! you are rockin it with the converse! so chic! glad you had a great weekend. 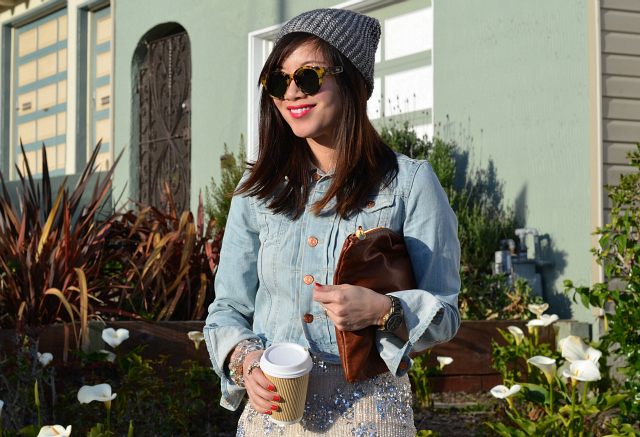 love how you dressed down this sequin skirt - you look perfect! I love that you paired a denim jacket w/ the fancy dress, love that look! Great outfit Nancy - I love how you can pull an more evening piece of clothing and make it so chic & laid back! Your sunglasses are so super cute! Your style is sooo fun! I would have never though to pair these pieces together! Adore ur style & personality thru ur post. Great outfit! I love perfect weekends and I love the extra sunshine as well! I swear, you have the most stylish closet! That skirt is fabulous, and I love that you've paired it with converse. I'm still not used to the daylight savings either, especially because it's just been rainy these past few days! Love how you combined the denim and sequins, really edgy look.